Diatomic nickel ions (gray) are captured at cryogenic temperatures in an RF ion trap; cold helium gas (blue) serves to dissipate the heat. The magnetic field orients the ions. Previously it was only possible to cool down about one thousand ions to 7.5 K using buffer gas. However, a thousand ions are not nearly enough for spectroscopic analyses. The ion trap with this new method provides a new opportunity to use cryogenic X-ray spectroscopy to study the magnetism and ground states of molecular ions. This is the foundation needed to develop new materials for energy-efficient information technologies. "Until now, everyone assumed it would not be possible to reach lower temperatures at such a high density of ions with a quadrupole ion trap. But it can be done", says HZB researcher Tobias Lau. This is because the RF electromagnetic field doesn't just trap the stored ions, but "jiggles" them as well so they are constantly gaining energy and rising in temperature. In order to draw off this additional energy, the team introduced helium as a buffer gas, and at relatively high pressure. "You have to imagine this as kind of a cold syrup that damps the macro motion of the particles, slowing their rotation and translation", explains Vicente Zamudio-Bayer from the University of Freiburg. The experiments were carried out using the UE52-PGM station at BESSY II where polarisation of the soft X-ray radiation can be varied. The experimental set-up at this beamline is unique in facilitating X-ray spectroscopy of cryogenic ions under externally applied magnetic fields. The sample can be analysed in an externally applied magnetic field using circularly polarised X-rays (X-ray magnetic circular dichroism/XMCD). This yields information about the magnetic moments of the electrons subdivided into both spin and orbital contributions. 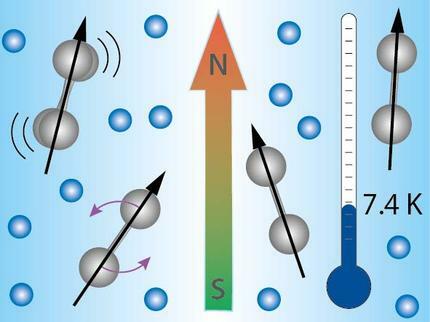 "We were able for the first time to experimentally determine the magnetic moments of nickel dimercations thanks to the especially low temperatures", Lau continued. The work on the ion trap is part of a larger project of HZB and the Univ. of Freiburg being funded by the German Federal Ministry of Education and Research. "We are now working on reaching even lower temperatures. We hope we will soon get to 5 K", offers Zamudio-Bayer. The lower the temperature, the more clearly the magnetic effects show up. But all users of the ion trap at the BESSY II UE52-PGM station can benefit already from the record achieved. "Not only magnetism, but also many other properties of a wide range of different molecules can be studied spectroscopically here, such as transition-metal ion complexes. That will therefore be attractive to many users, especially those in physical chemistry", Lau thinks. V. Zamudio-Bayer, R. Lindblad, C. Bülow, G. Leistner, A. Terasaki, B. v. Issendorff, and J. T. Lau; "Electronic ground state of Ni2+"; J. Chem. Phys. ; 145, 194302 (2016).